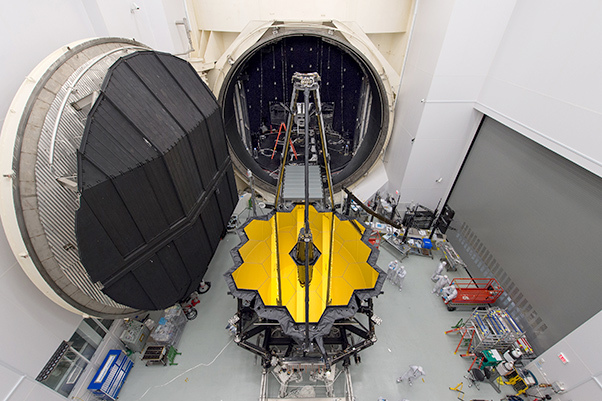 NASA’s James Webb Space Telescope sits in front of the door to Chamber A, a giant thermal vacuum chamber located at NASA’s Johnson Space Center. The telescope will soon be moved into the chamber, where it will spend a hot Houston summer undergoing tests at sub-freezing cryogenic temperatures. The telescope will operate at an extremely cold 39 K (-234° C or -389° F) in space, so NASA is simulating those conditions on the ground, ensuring the optics and instruments will perform perfectly after launch. In space, the telescope itself must be kept extremely cold, in order to be able to detect the infrared light from faint and very distant objects. To protect the telescope from external sources of light and heat (like the sun, Earth, and moon) as well as from heat emitted by the observatory itself, a five-layer, tennis court-sized sunshield acts like a parasol providing shade. The sunshield separates the observatory into a warm, sun-facing side (reaching temperatures close to 400 degrees Farenheit), and a cold side (185 degrees below zero) where the sunlight is blocked from interfering with the sensitive telescope instruments. 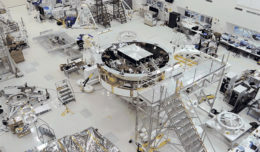 For more information about the Webb telescope visit www.jwst.nasa.gov or www.nasa.gov/webb.